Interpreting this month's photo was a BIG challenge. The execution of my interpretation led me to experiment with solutions to get effects that had not previously come up in my work. 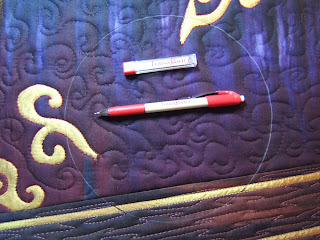 Details and photos of the process can be seen at my reveal post on the "Interpret This" blog. I'd like to share this one that was not included. I had bought this marking tool by Fons and Porter quite some time ago. This is the first project that needed marks on dark fabric. It makes a fine, distinct line with hardly any effort. I love it. Right now, I couldn't say whether I like this interpretation ... or not. There are moments when it just looks like a glorified placemat with a dirty dish to me. There are moments I think about cutting it up to use the appealing parts in something else ... postcards maybe. My mind may change. It's possible that I might decide it's alright. There are some pieces that need the perspective of time away from it in order for me to "really see" if it is successful ... or not. While you're at "Interpret This" be sure to scroll down and see the six interpretations that preceded mine. There will be one more reveals this evening and then two more tomorrow. Who would think that a dirty plate could look so decorative?! Your interpretation is brilliant Nellie and so clever. 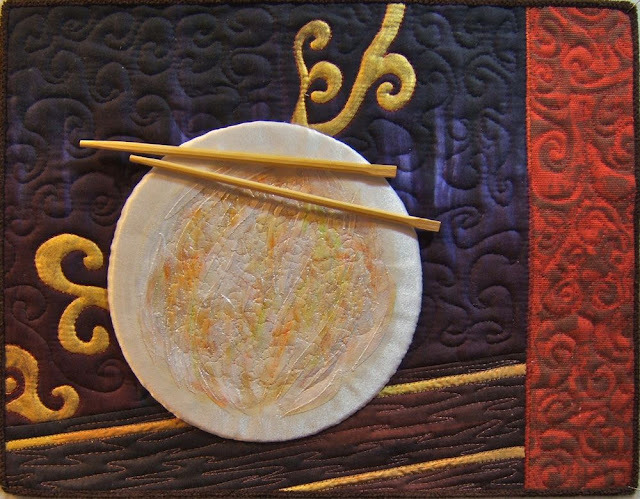 I love the chopsticks and your swirling quilting pattern. Looks like my plate, when I finish! Love the gold touches! These challenges are so amazing. I have had to really work at them and I love it! Although in the thick of it I am gnashing my teeth through it all... Tell me about that pen! It is just what I needed, like yesterday! LOL. I really love reading about how you did this and that 'clean' plate is beautiful.